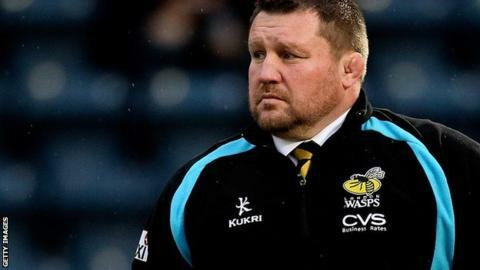 London Wasps boss Dai Young says the European Rugby Champions Cup has given his seventh-placed side new motivation. The final place in the inaugural competition next season will be decided by a play-off between the seventh-placed teams in the Premiership and and France's Top 14. Previously, only the top six in England qualified for the Heineken Cup. "We want the chance to play in Europe - two or three weeks ago we felt that was beyond us," said Young. Talking to BBC Sport, Young continued: "We have been given another chance really, but we still have two big games to play now and we have to nail them. "If we are lucky enough to give ourselves a shot at a seventh spot, then I'm sure any French team that we are likely to play will be quality. "I've said many time that we want to be back in Europe's top competition, the plan has been to improve this season and give it a real crack next season. So if we get there this season its probably a season in front of the plan." The new elite European competition which replaces the Heineken Cup was given the go-ahead earlier this month, and will involve 20 teams, rather than 24 and includes six from the Premiership, six from the French Top 14 and seven from the Pro12. The remaining spot will be decided by a play-off between the seventh-placed teams in England and France in the first season, two further teams from the Pro12 will contest the play-offs after that. Wasps are currently 12 points behind Sale in sixth place and four points ahead of Exeter Chiefs in eight. Hopes of European success this term were ended by Bath at the semi-final stage of the Amlin Challenge Cup on Sunday. "This competition was our only realistic chance of getting some silverware this season or getting into a final, but obviously next week is now an important game for the club," said Young.